Irish jockey Pat Cosgrave can’t decide if Best Solution’s wide barrier is good or bad for his chances in the 2018 Group 1 $5m Stella Artois Caulfield Cup (2400m) at Caulfield on Saturday. Jockey Pat Cosgrave, above in all blue colours winning the Ladbrokes Stakes on Benbatl, will ride Best Solution in the 2018 Caulfield Cup at Caulfield. Photo by Ultimate Racing Photos. Best Solution drew barrier seventeen in the original draw of eighteen plus two emergencies but the Saeed Bin Suroor trained five year old will move in two spots if the final top eighteen remain intact at start time. Cosgrave admits that the wide gate will make his job harder, but said he will just have to work with it. “Everyone keeps telling me it’s a problem, it’s not ideal,” Cosgrave told the Herald Sun. “But someone has to be drawn 17, someone has to be drawn outside me which is even worse. “It’s one of those things, it’s going to make my life a little more difficult, but who knows what a good draw or a bad draw is. “Some people tell me that (barrier) one is the worst draw to get, but I was hoping to be drawn one before the draw came out. “I can probably ride him any way I want. I can ride him forward and hopefully get in. As well as a horror draw, Best Solution will have to carry the top weight of 57.5kg he has earned courtesy of his two recent wins at Group 1 level in Germany in the €175,000 Grosser Preiss von Berlin (2414m) at Hoppegarten on August 12 and in the €250,000 Grosser Preis Von Baden (2414m) at Baden Baden on September 2. Best Solution is currently marked at $15 for the Caulfield Cup with Ladbrokes.com.au and Cosgrave is selecting the Aidan O’Brien trained Irish Stayer The Cliffsofmoher as the the horse to beat. The Cliffsofmoher is on the third line of betting at $7 and has drawn at the opposite end of the starting gates at barrier three with top Australian jockey Hugh Bowman in the saddle. Bowman takes over from Mark Zahra on The Cliffsofmoher who made up good ground in the straight at his first run on Australian soil at Caulfield last Saturday when a closing fourth behind Cosgrave’s mount Benbatl in the Group 1 $1m Ladbrokes Stakes (2000m). “I thought The Cliffsofmoher was a big run from back in the field last Saturday,” Cosgrave said. “It was 10 furlongs (2000m) and I think he’ll improve going up to 2400m. “I think he’s one of our dangers but there are quite a few horses in the race with chances. “I’ve only got to give him a kilo, which is not so bad. The Darren Weir trained Kings Will Dream has also been impressive with three Group 1 placings from his last three starts and holds his spot at the top of the market order at $5, just ahead of the Chris Waller trained Youngstar at $6. 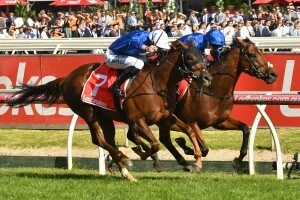 The two favourites finished side by side last start when Youngstar and Kings Will Dream ran second and third behind super mare Winx in the Group 1 $500,000 Seppelt Turnbull Stakes (2000m) at Flemington a fortnight ago.